House of Marley touts the use of cork in the construction of its No Bounds XL Bluetooth speaker. 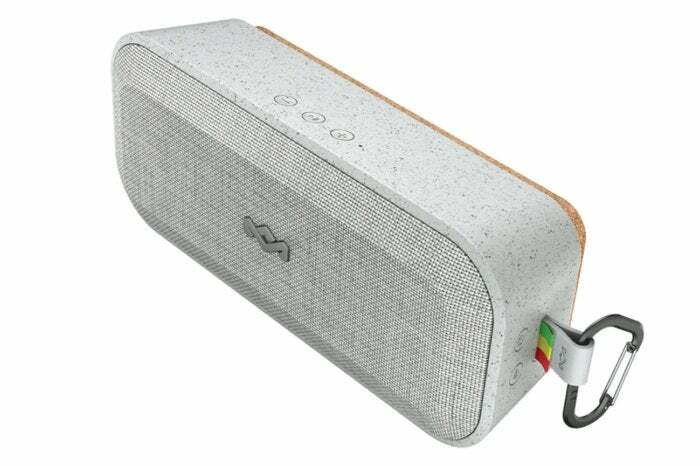 Asked to explain this odd choice of material, the company’s PR person replied that cork is “vibrationally resistant.” Most speaker enclosures employ materials that resonate to some degree, so that explanation didn’t make a lot of sense. Unless of course, you’re talking about a waterproof enclosure that you want to float. Aha! Yup. the No Bounds XL is about as pool-friendly as they come, sporting an IP67 rating, That means it can be submerged in up to one meter of water. (Dive to the bottom of the pool with it and you’re on your own.) 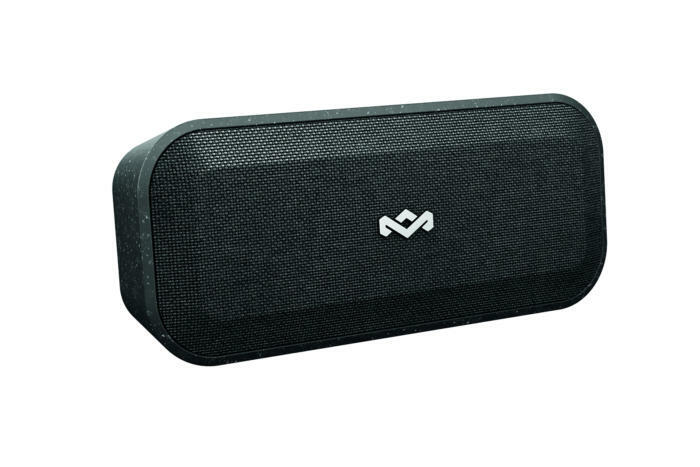 This speaker is also dustproof, if you want to head inland to drier areas. 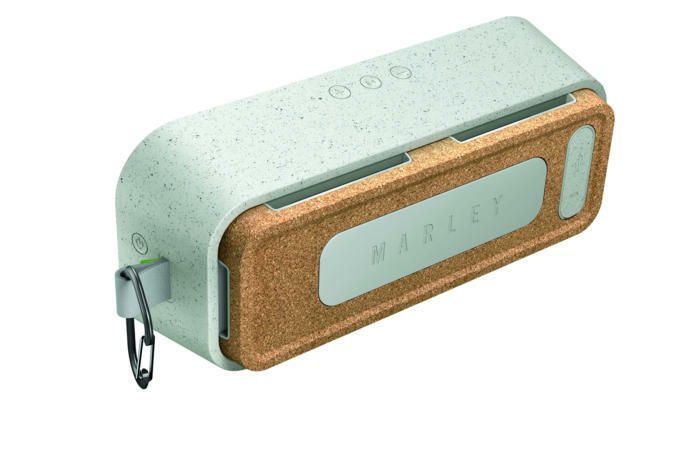 The other reason House of Marley chose cork is that it’s been recycled, as have some of the other materials used in constructing the No Bounds XL. Major props for considering the environment. More companies, and more of us, should do the same. 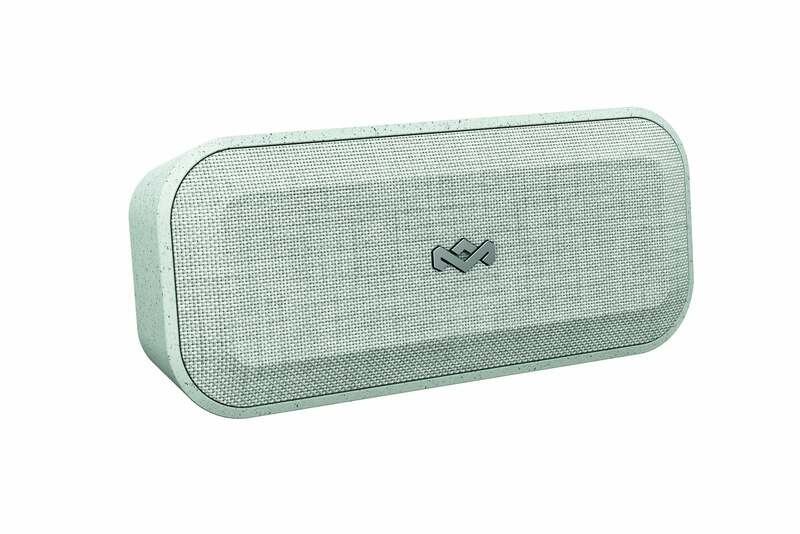 The No Bounds XL can lay on its cork back/base with the speakers facing up (as it floats in the pool), or on one of its sides with its speakers firing forward and up at a slight angle. The side that faces down is recognizable by two slender feet. It’s also the side without buttons, though said buttons aren’t particularly obvious at first glance, being the same marble pattern (gray or black) as the rest of the unit. The Marley No Bounds XL is roughly the shape of a smallish loaf of bread. The No Bounds XL measures 10 inches long, 4 inches wide, and 3.5 inches deep. It weighs a hefty 3.75 pounds without its AC adapter, which would be a bit of load in a backpack. As such, you probably wouldn’t want to take it on long hikes. A captive rubber plug in the No Bounds XL’s cork base protects its USB port and 3.5mm analog audio input. The base (or back, depending on how you orient it) of the unit, which is the part that’s obviously made of dense cork, has slots on the side to let out sound generated by the down-facing passive radiators. The active speakers consist of a pair of 2.5-inch drivers powered by a 10-watt amp, and a pair of 0.75-inch tweeters powered by a 5-watt amp. The volume up/next track and volume down/previous track (short press/long press) buttons, as well as the play/pause button and dual microphones (there’s a speakerphone mode) are on the top of the unit, while the power and Bluetooth (4.2) pair buttons are one of the short sides. Incorporated into the cork base is a rubber plug that covers a standard Type A USB port (for charging phones or other devices from the unit’s 2200mAh battery), a micro-USB port for charging the No Bounds XL itself, and a 3.5mm analog audio input. House of Marley apparently has a no-waste policy when comes to documentation as well. The multi-lingual user’s guide sheet is barely adequate. Hence my hint about short press/long press above. Alas, while the No Bounds XL has a lot going for it in terms of rugged design and looks, the sound it produces is just middling, especially at low volume. Speakers using materials and design that are waterproof aren’t generally audiophile class, but even given that, the No Bounds XL isn’t the best effort I’ve heard from the genre. Specifically, the mid-range is a bit muddy, there’s no brilliance on the top end, and the bass leans farther towards punch rather than boom. Good bass is a nice balance between the two. I also noticed some bass pumping/pulsing, which might have been a Bluetooth artifact, but more likely is the emanations from the speakers stepping on each other. The Marley No Bounds XL is also available in marbled black. Once you crank it, on the other hand, the No Bounds XL starts to come into its own. The volume is decently loud, there’s no distortion that I could hear, the bass pumping largely disappears, and in a setting where you’re listening around the picnic table or pool, the sound is quite acceptable. Condensing all that, the No Bouds XL isn’t the speaker you want for quiet, contemplative listening, but it will do the trick for parties. Run time in my tests was around 18 hours, almost in line with the 16 hours Marley claims. Your mileage will vary. The No Bounds XL is more than competitive with most outdoor speakers in this price range in terms of features, nature-resistance, and lack of guilt (relatively). The sound is slightly below average at low volumes, but at least average when it’s loud. Combined with another No Bounds (no other vendor) speaker in TWS (True Wireless Stereo), it perks up quite a bit as well. Quietly on a desk, no. In the pool or on the patio, yes. We love that the No Bounds XL is made, at least partially, of recycled materials and that you can toss it in the pool and splash about without worrying (don't dive with it). Sadly, the sound isn't particularly good, a common issue with waterproofed speakers. Buy for fun, but not for sound. IP67 rating means its water- and dustproof.